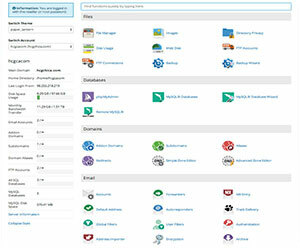 cPanel is simply the best, most comprehensive graphical web-based web hosting control panel in the world today! Creating and managing email accounts. Protecting a website’s content and bandwidth from abuse. Generating and reviewing website hits and statistics. Reviewing access, FTP and other server logs. Backing up and moving files. Fantastico F3 and Deluxe Apps includes more than 600 of the worlds best web site scripting programs, like Wordpress, Joomla, OS Commerce and much more-- all included FREE with your website hosting account. What is even more exciting is that most of these programs may be installed on your website with no technical expertise, in as few as three clicks [click-click-click-done!]. See the latest list of Fantastico F3 scripts now.